Are The Shenanigans Ever Going To Be Dealt With? In the past two years or so, we have learned that a sitting Presidential administration spied on an opposition candidate. We have learned that the apparatus of government was used in an attempt to elect a president from the same party as the sitting President. We have seen lying before Congress go unchallenged, opposition research used as an excuse for violating the civil rights of Americans, and people targeted by a Special Counsel simply because they were friends or worked with a person the Special Counsel was targeting. In plain English, we have seen the Soviet concept of ‘show me the person, and I will show you the crime’ put into practice in America. When does America wake up and realize that while we are looking at an investigation of a shiny object over there, major civil rights violations are being ignored? This is a level of corruption in Congress that we have not seen in a long time. That was before Michael Cohen had his office raided by the FBI and other misconduct by the Mueller investigation. We have entered the age of the secret police, and unless someone stands up and says ‘enough’, we will continue in that direction. Yesterday the U.K. Daily Mail posted an article about Michael Cohen, currently playing a role in front of the House Oversight Committee. The article reports that before the FBI raided his offices and threatened him with jail time, Mr. Cohen was trying to obtain a book deal for a book praising Donald Trump as President. The article has a lot of interesting information, but there were a few things that really stood out to me. Cohen was pushing a book with the working title ‘Trump Revolution: From The Tower to The White House, Understanding Donald J. Trump,’ that he proposed to write. ‘I am not protecting Mr. Trump anymore,’ he added. ‘My loyalty to Mr. Trump has cost me everything: my family’s happiness, friendships, my law license, my company, my livelihood, my honor, my reputation, and soon my freedom. Would someone please explain to this man that his predicament is the result of his own decisions as well as those of a crooked justice department out to unseat a duly-elected President. His choice to evade taxes, lie to Congress, and be involved in shady business deals has little to do with President Trump. The stupidest choice he made was to keep incriminating records in his office. His predicament is sad, but blaming it on the President is unfair. Why not blame it on those seeking to remove President Trump from office? I’m sure you recognize the above quote from Shakespeare’s Macbeth. It also pretty much describes the investigation carried out by Special Prosecutor Robert Mueller. What started out with many people convinced that Russia interfered in our election has now boiled down to the fact that President Trump paid some women he behaved badly with to keep quiet. Wow. Talk about a downward slide. Mark Penn, who formerly served as an advisor to President Clinton, posted an article at The Hill yesterday which illustrates some of Robert Mueller’s mendacity. I’m experiencing 1998 déjà vu as prosecutors once again work overtime to turn extramarital affairs and the efforts to keep them secret into impeachable high crimes and misdemeanors. Unable to get the witnesses to compose the stories they want, today’s prosecutors are discovering they can simply compose the crimes by manipulating the pleas of men desperate to protect their families. 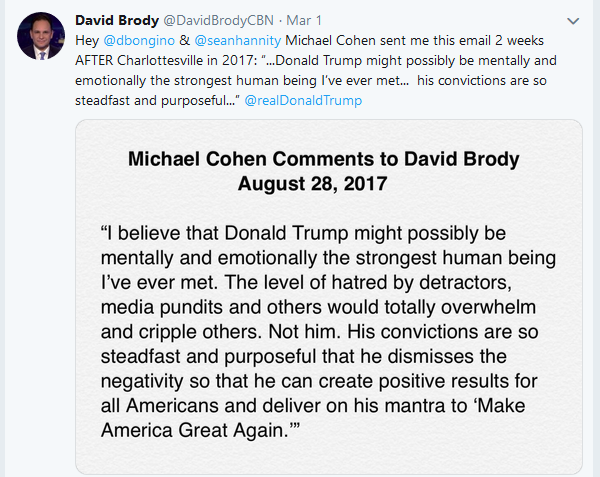 The Michael Cohen sentencing memo took aim directly at both Cohen and President Donald Trump. It was used, unethically, to cast the president as directing a criminal conspiracy to make “secret and illegal” payments. Sentencing memos are not supposed to use secret grand jury info to point fingers at those who are not being sentenced, but that’s exactly what these did. One can say today that these New York prosecutors, acolytes of fired U.S. District Attorney Preet Bharra, have learned that the “plea’s the thing wherein to catch the king.” First, they went after the man, not the crime, and turned up millions in unpaid taxes and some bank-loan misrepresentations by Cohen. At that point, they convinced him to cave for the sake of his family; the trick was to get him to plead guilty to supposedly two campaign finance “felonies,” and then vaguely implicate the president as directing them (which Trump denies). Despite promises to the contrary from prosecutors, they threw their star witness off the bus anyway, making him the biggest chump in this drama after he hired attorney Lanny Davis and burned all his bridges with his former client. Once they had the guilty pleas in hand, the prosecutors no longer needed Cohen; they trashed him as a greedy liar and called for substantial jail time. The reason these two guilty pleas were so valuable is that these prosecutors could not, in my opinion, have gotten them in court. The first payment was not even made by Cohen but by American Media Inc., a bona fide media company with First Amendment protections; it could have decided to use the story that it bought, hold the story, or just prevent some competitor from using the story. The article also points out that the typical remedy for a campaign finance violation is a fine–not indictment or impeachment. This charade is getting very old. Robert Mueller has been a man in search of a crime. He felt as if he already had the guilty party in his sights, he just needed to find the crime. Just for the record, that is not how the American justice system is supposed to work. Yesterday The Washington Times posted an article about Lanny Davis. Lanny Davis is the longtime friend of the Clintons who is now Michael Cohen’s lawyer. That in itself defies logic, but then it gets worse. Lanny Davis told BuzzFeed News on Monday evening that he was a source for the story claiming that President Trump had personal prior knowledge of a controversial Trump Tower meeting with Russians — a story the Cohen camp has since repudiated. “I made a mistake,” Mr. Davis said. But as other news outlets wrote stories “matching” the CNN scoop, which if true would contradict the president’s repeated and public denials of any knowledge of the meeting, Mr. Davis was eagerly confirming the story to those other outlets. The New York Post and the Washington Post each has publicly named Mr. Davis as their confirming source for their Trump Tower meeting stories, despite initial grants of anonymity. I am willing to wager that at least half of the people in the country who heard the original statement have not heard the retraction. What Lanny Davis originally said was a lie–not a mistake–intended to make President Trump look bad. The lie traveled, and I suspect the truth has not traveled as far. This sort of lying is one of the reasons for the divisiveness in our country right now–there are an awful lot of Americans walking around believing the lies the mainstream media is telling them every day. When confronted with the truth, they become defensive. The damage to our country that the mainstream media is doing is almost incalculable. As they persist in their biased lies, I believe we will see the alternative media grow stronger (if the alternative media can tell the truth that is not being told). I look forward to the day when we have a media that tells the truth and lets Americans draw their own conclusions. Yesterday The Washington Examiner posted some comments by Attorney Alan Dershowitz regarding the raid on the offices of Michael Cohen, the personal attorney of President Trump. Harvard Law professor Alan Dershowitz warned Monday that special counsel Robert Mueller’s decision to raid President Trump’s personal lawyer’s office is an assault on the privileged lawyer-client relationship. Dershowitz said on Fox News that he believes the decision to raid Michael Cohen’s office would be a sign that Mueller is trying to turn Cohen against Trump. Dershowitz, who has drawn the ire of Democrats for defending Trump, said Mueller’s move is also dangerous because it gives the FBI the option of deciding what information seized from Cohen to pursue. “The deafening silence from the ACLU and civil libertarians about the intrusion into the lawyer-client confidentiality is really appalling,” Dershowitz said. I firmly believe that the raids conducted in coordination with the Special Prosecutor‘s Investigation were totally unconstitutional. This sets a very bad precedence for the future. It is also a very strong indication of the total politicization of the FBI and DOJ during the past administration.